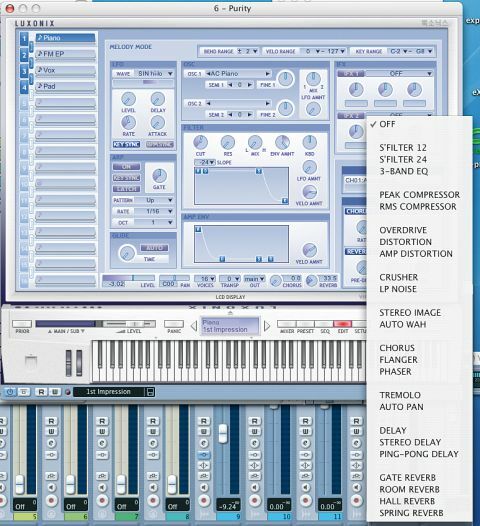 Purity´s easy to use and features loads of sounds. If you want to get music done quickly, this is one of the very best solutions out there. Loads of great sounds Very efficient Incredibly easy to use Good synth sections. Arrangements area is a bit redundant A few sounds don’t hit the mark. Forget emulating classic analogue synths: the real aim for many developers recently has been to replicate the good old digital synth workstation. We're talking about the kind of hardware that kept Roland, Yamaha and Korg in Yen throughout the late 80s and 90s. Sure, we've had SampleTank and Hypersonic, but no one really caught the spirit of the originals until Korg launched their own Legacy Collection Digital Edition, which features plug-in versions of the M1 and Wavestation. We should also remember that Steinberg have given Hypersonic a valuable shot in the arm by updating it to version 2, so has Purity, a new module from Luxonix, arrived too late? Possibly not. You may already know about Luxonix's Ravity plug-ins - drum and synth modules so light on hard disk space requirements (just 40MB in each case) that you wonder how they actually manage to generate all their sounds. These instruments are also extremely processor-efficient. You'll be pleased to hear that Purity also has these two benefits - its 1,300 factory presets take up a mere 100MB of space on your hard drive. In fact, Luxonix's approach to all of their applications - and Purity in particular - seems to be to make everything as straightforward as possible. Purity is easy on your processor, easy on your resources and easy to use - so much so that you hardly notice it's there at all. You're left completely free to just get on with making music, which has to be a good thing, doesn't it? Installing the software is also a breeze. There's no online registration needed, just a couple of serial numbers to input. The Purity interface feels like an amalgamation of the hardware synths that it's trying to recreate. It has the silvery white sheen of a Yamaha or Korg and you'll soon stumble across is the General MIDI sounds that were so ubiquitous in 90s music technology that virtually every piece of sonic hardware featured them. You either loved this standard set of instruments, synths and sound effects or you hated it, but thankfully the world has moved on and Purity also comes stuffed to the gills with other sounds. That said, there's another love it or loathe it bank called 'Motive'. This includes a bunch of split keyboard arrangement presets and is filled with phrases and accompaniments in a variety of styles (such as dance, drum 'n' bass, mid step and Latin). These are OK, but we think that most people will skip past them relatively quickly. So far, then, all we've seen from Purity are 90s hardware keyboard features that really should have been left in the past. Luckily, however, the soundbank quickly improves, featuring some useful phrases and sequences that bring the workstation right up to date. In particular, there are some great growling and hoovering sounds for dance, and loads of riffs for electronica and trance. All of a sudden, Purity feels like an instrument of its time. Following this lot are the expected banks of virtual instruments - these are a bit of a mixed bag. The drums provide some useful hits across a variety of kits, while the pianos are a blend of very good and so-so. The organs are great, while the guitars are generally superb, albeit occasionally thin-sounding. The strings make great use of the onboard effects, the brass is spot on (give it up, synth programming people!) and woodwind isn't that bad, although the oboe really does have a 90s feel. There are also five more sections for synth presets - these really show off the software's strengths, with the Fast Synth folder being particularly impressive. So, Purity's stock of presets offers a bit of everything. The fact that most of it sounds extremely good is amazing when you consider the synth's size and CPU efficiency. With all of that stuff to cram in, it's a good job that Purity is a doddle to navigate around. The 16 parts (for a 16-part MIDI multitimbral setup or combination play) run down the left and show the presets that you've dialled up. The big space in the middle can be dedicated to a mixer (with effects), a preset list, a pattern sequencer, an edit screen (for more synth options), or a setup screen for global edits. All of these are accessed using the switches to the right of the screen and there's even a panic button to the left of it. However, Purity's so simple that we don't think you'll have much cause to use this (unless you're a particularly nervy type). In fact, simplicity is where Purity really scores. There are better sounding plug-ins out there, but not for this money and not with the low load that this synth imposes. Add to this its brilliant architecture, a bonus sequencer (should you want to use it standalone), 24 insert effects and more synthesis features than many other ROMpler-type sound generators, and Purity becomes a product that we can wholeheartedly recommend to musicians of every persuasion.